Patricia Lord, longtime supporter and contributor of The Darling Trust on behalf of the Mackintosh Foundation and in her own capacity - has been instrumental in bringing the dream of educational programmes and assistance to the community since The Darling Trust’s inception Her last visit was in 2009 when the foundations of our centre were being laid. This year Patricia paid a welcome visit to our educational centre, which is in full swing with 2 classes of 30 Grade R learners each. 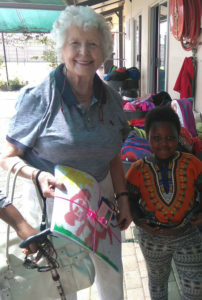 We were honoured to have Patricia experience a class with our learners. Thank you Patricia and the Mackintosh Foundation for your dedication to our cause and giving us peace of mind that we may always provide the best learning assistance possible!